Super easy, super yummy muffins with no nasties. The only sugar is in the form of a few mixed berries, which you can leave out if you like (I tried this initially and I think they’re yummier with a little hit of sweet and sour). 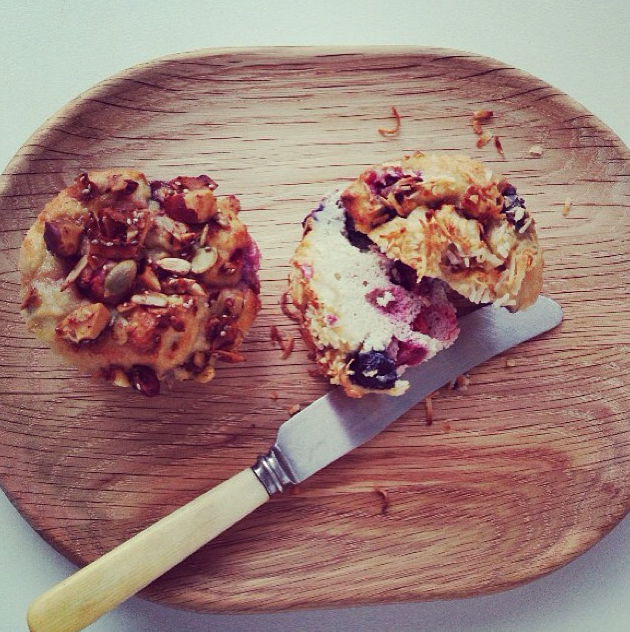 Use this as a base recipe for any type of muffin, add in whatever you like – substituting the nuts and berries e.g. dried fruit, dark chocolate, chopped banana, or for a savory option try veggies and cheese. Pre-heat oven to 180 celsius and line a regular sized muffin pan with 6-8 patty cases. In a large bowl whisk together the coconut cream and eggs until combine. Add the coconut oil – if you’ve just melted your coconut oil, whisk it in slowly as the warmth might leave you with scrambled eggs. Sift in the baking powder and flours, stirring to combine. The mixture will initially look quite wet however I’ve found coconut flour results in a mixture that becomes firmer over a minute or so rather than strait away. Add in your nuts and berries, stirring until just combined. Spoon the mixture into your prepared muffin tin. Top with some nutty granola or shredded coconut and bake for approximately 30 minutes – until a skewer comes out clean.